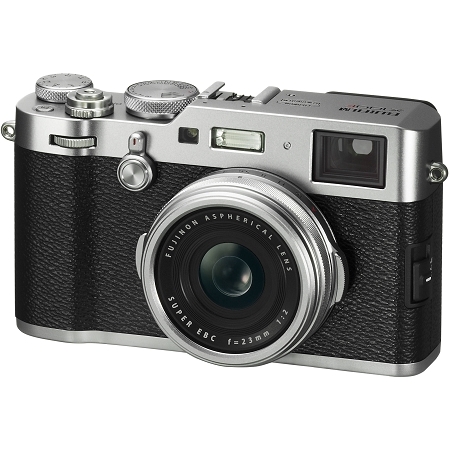 The Fujifilm X100F is the company's fourth-generation fixed lens camera with an APS-C sensor. It retains the same rangerfinder design of its predecessors, but adds an AF point joystick as well as an ISO dial on the top plate. The 35mm equiv. F2 lens is unchanged, as is the unique hybrid viewfinder and fixed 3" LCD. Inside, the camera has a new 24.3MP CMOS sensor along with an updated image processor. The ACROS film simulation mode is new, as is an electronic shutter that tops out at 1/32000 sec. As one would expect, Wi-Fi is a standard feature. This camera has a fixed 23mm (35mm equivalent) lens that is built into the body and cannot be removed. This gives it a more compact footprint than the same lens attached to an X-T2, but is less flexible. Rental Includes: Body, strap, lens cap, battery, charger, and 16 Gig SD Flash card.